How To Get The Best Mobile App Development Company or Developer for Your App Programming? Developing a mobile application for your company can be a wise move at this stage when everyone is moving towards the mobile devices and digital world. Everyone knows the plethora of benefits a mobile app for business brings with it. If you don't have an in-house team then the remaining options are to either hire a mobile developer or outsource your mobile development project to an experienced company. This might sound easy. However, scouting a right mobile app development company or hiring a right app developer is a daunting and difficult task. This article will guide you with the step by step procedure to get the best app development company or a developer. Before jumping into the actual tips and tricks, the best suggestion I would like to make is, outsourcing your project to a mobile app development agency is advisable over hiring a freelancer or an individual developer. There are many reasons behind this such as, no dependability on a single developer, more professional and formal approach, legal advantages, etc. 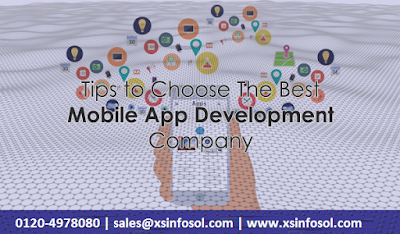 However, if you want to hire a mobile app developer then also these tips will be helpful. Before approaching any developer or agency, you need to be precise about your exact requirements. Pen down the features you want, platforms in which you want to develop your mobile app such as Android, iOS, Windows, etc. Also, be clear which are the must have features and which can be added later on or skipped completely. Once you are clear about your exact requirements, list out the best and experienced mobile app development companies, which can be easily scouted from the web. You can also get the list based on geography, if you have any preference for that. Once you are ready with the list, have one on one meeting or conference with the mobile app development providers. Narrate your requirements to them. Check what they have understood. Ask for written proposals and scope of work to ensure they have addressed all your points and issues. All these communications should be done verbally as emails and chat might be confusing or can create misunderstanding. Once you finish the initial discussion and receive the required documents, start comparing the offers. If you are not a technical person, then involve your tech lead into this stage. Filter out the mediocre or way too generic proposals. List the specifically created and the best proposals, which seems to be worthy to get considered. Give cost second priority here as cheaper is not always better. This is a crucial one time investment, so ensures the quality over price. Once you make a list of the best mobile app developer/ development companies, start discussing on the next level. In this stage, you will get an opportunity to ask for the discounts, added support, etc. Feel free to show them the comparison with other proposals. Ask what extra they can offer over the competing bidders. Try to gauge the quality, price and added services the company is willing to offer. Also, check the enthusiasm to get your project because it will lead to in-time mobile app development. Once the final discussions are over, you will have the best mobile app development company or a developer which can live up to your expectation and values. Developing a mobile application for your company can be a wise move at this stage when everyone is moving towards the mobile devices and the digital world. Everyone knows the plethora of benefits a mobile app for business brings with it. If you don't have an in-house team then the remaining options are to either hire a mobile developer or outsource your mobile development project to an experienced company. This might sound easy. However, scouting a right Android app development company or hiring a right app developer is a daunting and difficult task. This article will guide you with the step by step procedure to get the best app development company or a developer. Before approaching any developer or agency, you need to be precise about your exact requirements. Pen down the features you want, platforms in which you want to develop your mobile app such as Android, iOS, Windows, etc. Also, be clear which are the must-have features and which can be added later on or skipped completely. Once you are clear about your exact requirements, list out the best and experienced mobile app development companies, which can be easily scouted from the web. You can also get the list based on geography if you have any preference for that. Once you finish the initial discussion and receive the required documents, start comparing the offers. If you are not a technical person, then involve your tech lead into this stage. Filter out the mediocre or way too generic proposals. List the specifically created and the best proposals, which seems to be worthy to get considered. Give cost second priority here as cheaper is not always better. This is a crucial one-time investment, so ensures the quality over price.